It was October 2009 on the rooftop of a hostel in Banos, Ecuador when I first met Eng – my British little buddy. We spent the next couple of weeks traveling together south to Peru – bonding over a love of food, people watching, and adventure. I’ve met up with her in her hometown of London – where we later travelled to Albania, Macedonia, and on to Turkey (where Eng took photos of me being attacked by a turkey). We have some pretty funny memories together. So when the invite for her wedding came, I knew I couldn’t miss it. I pulled out one of my hand-made fascinators and packed my bag – I was ready to attend my first English wedding. Last Friday I went to Waterloo train station where I met up with Kate and Helen – two lovely London girls that Eng and I met in Olympus in Turkey. A train, ferry, a winding cab ride later, we arrived at the East Dene, Bonchurch, Ventnor – one of the Isle of Wight’s premier outdoor education centres. While most people attending the wedding chose to stay in a hotels or inn on the island – there were around 15 of us who lucked out and got to stay on site at the venue. That meant bunk beds, a cafeteria-style breakfast, and time to play around on rope swings and obstacle courses at the venue. On Saturday morning we got to see Will, the groom, and assist with a few last minute decoration details. Will and Eng had told everyone to be there at 12:30 but the ceremony wasn’t set to take place until 1:30 – giving those of us on site more time to play around with our roommates things (hey – it did feel like we were at camp). I dragged in a bench from the hallway to help with our pre-wedding primping. We grabbed James from his bunk down the hall, some much needed man candy, and did a last minute check before it was time for the ceremony. The ceremony was short and sweet – afterwards we were ushered to the lawn to pick up some bubbles before creating a lane for the newlyweds to walk through. We barely had time to say cheers before a reggae beat started – and we all received the official Welcome to the Isle of Wight by singer Derek Sandy. (Please click that video – because he was amazing). Eng had sent an email with restaurants, activities, and wedding details and finished with a youtube video to get us in the mood. Never would I have imagined that Derek Sandy would grace Eng & Will’s wedding to perform his hit song and serenade us with an afternoon of Bob Marley and UB40 hits. It was amazing! I should have kept on my sunglasses because I was quite teary eyed in my photo with Eng. Eng, of course, looked absolutely stunning. I thought her wedding dress was perfect. Although she was leery of the new girl, I had a chance to say hello to Eng & Will’s precious little one – who I met for the first time along with Momma Su. The weather was lovely, an anomaly for a bank holiday weekend in England, and we took advantage of the bubbles, lawn chairs, and pool toys. The tray passed appetizers were heavy on the gluten – so the staff brought me my own celiac-friendly tray. As the bride and groom visited with the guests – we had time to enjoy some of the venue features – including swings and table tennis. Later in the afternoon we sat down for an meal of crab cakes, enormous lamb legs, and cheesecake. After dinner it was time for speeches. Will’s speech was comical yet touching – I’m so happy my friend has ended up with such a lovely man. Since I don’t know Will well, I thoroughly enjoyed his friend’s speech roast which was accompanied by photos and awe-inspiring newspaper articles. After dinner I watched as Will cut through what I thought was dessert cake – but soon learned was a giant meat cake; the couple’s non-traditional personal touches to the wedding day were everywhere. The meat cake turned out to be a hit, sadly I couldn’t partake but the selection of Isle of Wight cheeses were delightful. As the evening wore on the party moved from the tent to the main building – I called it a night shortly after midnight – but not before the limbo bar made an appearance on the dance floor. The next morning I indulged in a full English breakfast – including gluten free sausages and mini waffles! Staying at the venue certainly had its perks. The newlyweds showed up with some more family and friends to take advantage of on-site pool and the sunshine. Will had misplaced his wedding suit jacket, ipad, and a few other items, but it wasn’t going to stop him from going for a dip with his little girl. I could have stayed there all day, but sadly we had to make our way back to the mainland. I got in some last minute quality time with Eng as we deflated the swan and the flamingo. 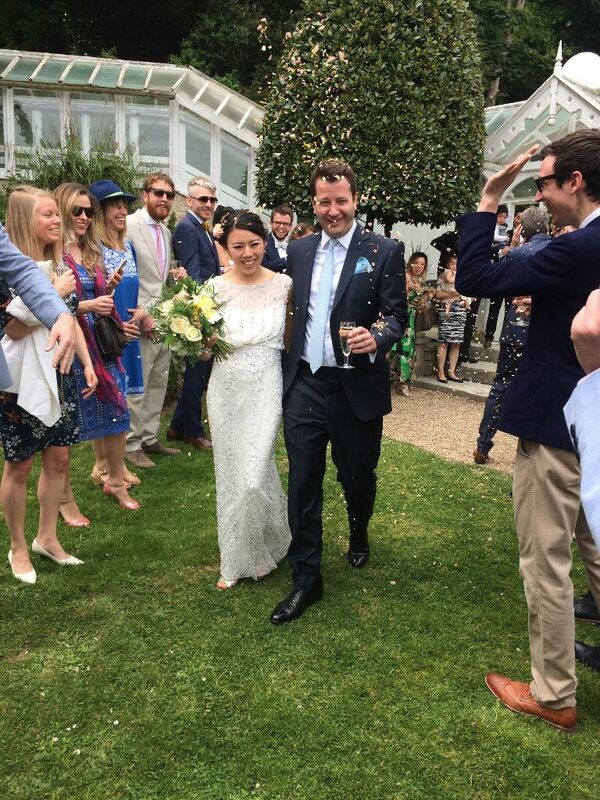 My first English wedding was certainly a memorable one. Thank you to Eng and Will for inviting me to be part of your big day and also to Helen and Kate for being such fabulous dates.